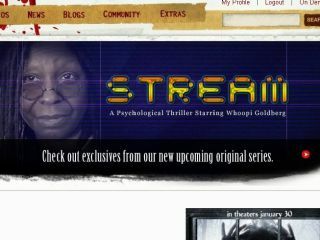 Whoopi Goldberg is moving into online science fiction, agreeing to star and produce in 'Stream' on VOD website FEARnet. The 53-year-old Oscar-winning actress has come out of retirement to play a part in something that she considers 'the future'. "I did retire. I hadn't made a movie in quite a while, and I lost my way with the things I was doing. It became entertainment by rote, and there wasn't a lot being done that I was interested in doing," Goldberg told Reuters. "I can reinvent my way of acting so that I challenge myself and see where it takes me for the second half of my life." Goldberg, who of course became a cult figure in sci-fi with her guest starring role in Star Trek: The Next Generation, may well have a point with an increasing understanding from producers that online videos appeal to a key viewing demographic. There was a time when television was seen as green pastures for movie actors that could no longer hack it on the big screen, but that perception has swung completely in the past decade. Equally, the likes of Joss Whedon's Dr Horrible's Sing-Along Blog, MSN's glossy Kirill and Felicia Day's The Guild are all beginning to illustrate that programmes made for the internet need not be poorly produced, and can attract great actors and writers.